Strip the parsley leaves from the stems; coarsely chop the leaves. Set aside half for garnish. Pat the steak dry with a paper towel; season generously with salt and pepper. In a large frying pan over medium-high heat, warm 1 to 2 tablespoons oil until hot but not smoking. Add the steak and cook, turning frequently, until well browned, 5 to 7 minutes for top sirloins, 6 to 8 minutes for rib-eye, and 7 to 11 minutes for filet mignons. Add the bagna càuda sauce base, half the parsley, and 1 tablespoon [2 TBL] ghee or butter, if using, and cook, spooning the sauce over the steak, until fragrant and warmed through and the steak is medium-rare, 1 to 2 minutes. Remove from the heat and season to taste with salt and pepper. Transfer the steak to a cutting board, then cut into ½-inch-thick slices. Set aside the sauce in the pan for serving. While the steak cooks, prepare the vegetables. Peel the onion and cut into 1-inch pieces. Trim the ends from the radishes; cut the radishes lengthwise into quarters. Cut the broccoli into 1-inch florets; trim any coarse stems. In a large frying pan over medium-high heat, warm 1 to 2 teaspoons oil until hot but not smoking. Add the onion and radishes, cut sides down, season with salt and pepper, and cook without stirring until starting to brown, 2 to 3 minutes. Add the broccoli and 2 tablespoons [¼ cup] water, cover, and cook, stirring occasionally, until the broccoli starts to soften and the onion and radishes are just tender, 2 to 4 minutes. Transfer the steak and vegetables to individual plates and spoon the bagna càuda sauce over the steak. Garnish with the remaining parsley and serve. Measure the ghee or butter, if using. Measure the water for the vegetables. This dish embraces the translation of the name bagna càuda, which means “hot bath,” by bathing steak in hot garlic and anchovy sauce. Hot bath! 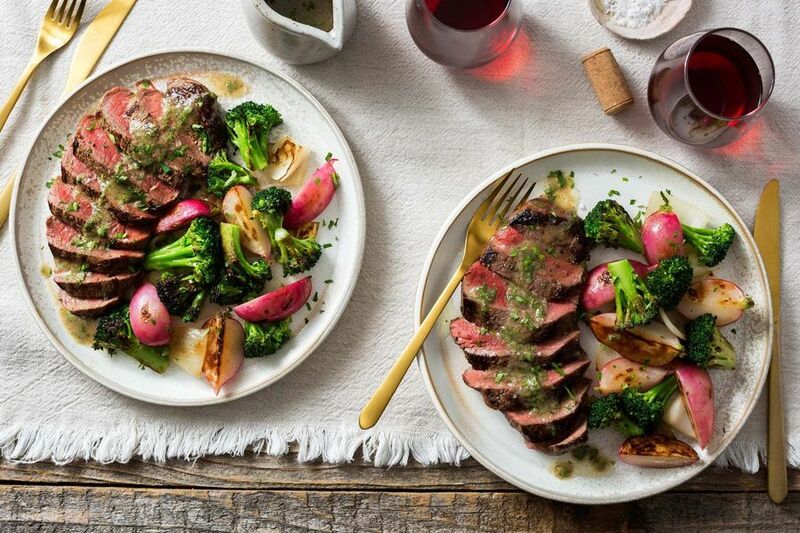 This recipe takes full advantage of the flavor-packed sauce and uses it to truly give your steak a “hot bath,” a technique known as basting. To make it easier to spoon the sauce over the steaks, carefully tilt the pan slightly so the liquid pools on one side. If you have a little extra time to spare, continue basting until the steak is cooked to the desired doneness, keeping in mind that applying the hot sauce means the steak will cook from the top and bottom. Calories: 690, Protein: 55g (110% DV), Fiber: 7g (28% DV), Total Fat: 46g (71% DV), Monounsaturated Fat: 28g, Polyunsaturated Fat: 4.5g, Saturated Fat: 11g (55% DV), Cholesterol: 160mg (53% DV), Sodium: 720mg (30% DV), Carbohydrates: 33g (11% DV), Total Sugars: 20g, Added Sugars: 0g (0% DV).